BluOcean has full options including Seakeeper Gyro Stabilizer keeping the vessel functional and seaworthy. One of the main characteristics of the Aicon Yachts is the particular attention to design and the style of their luxury yachts. Their vessels are not only aesthetically pleasing but are extremely comfortable. The company applies the latest technology and design elements to each of their yachts, thus creating a unique product, combining luxury, technology, and quality. 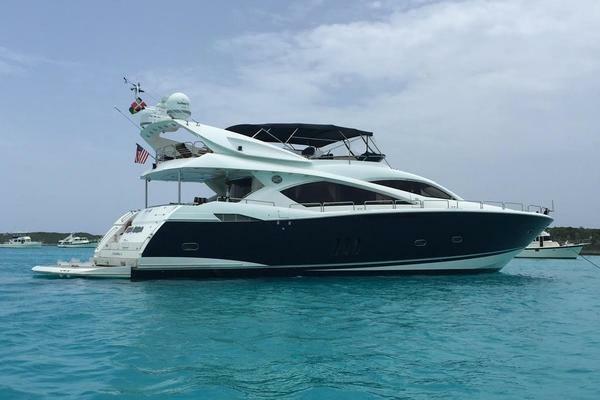 West Florida Yachts would love to guide you through a personal showing of this 85' Aicon 2010. This yacht for sale is located in United States and priced at $2,700,000. For a showing please contact us by filling out the form on this page and we will get back to you shortly! Very low hours with full-time captain and a crew. The yacht has been maintained with an open checkbook which makes this Aicon 85 motor yacht a unique and excellent buy in today's market. The owner is looking to trade up. Mechanical and generators total service. New wave runner and jet ski. 30k . TV 4K in every room. Special extra. Slide and pool with underwater fence for open water swimming 35k. The boat is in beautiful turn-key condition. Forward of salon a cherry wood and glass table and seating for 8 people. Privacy panels separate settee and wheelhouse. Indirect lighting in overheads. The master stateroom is accessed via staircase, centerline bed with upgraded fabrics, overhead lighting. VIP Stateroom is forward with a centerline bed. The fly bridge and full beam sun deck are accessed through the external staircase in the aft cockpit with teak steps. The forward/ Captain's stateroom provides sleeping for two adults on a full berth (w/ storage below), a dual hanging locker, and an AM/FM radio & CD player. The forward salon (Crew area) featured two (2) benches, an adjustable wooden table, multiple storage lockers, two (2) electrical panels, a compact refrigerator, a stainless steel counter top w/ a stainless steel sink, an electric cook top, and an extractor / fan. The forward starboard/ Crew quarters provides sleeping for two adults on upper and lower single berths (w/ storage below) and a hanging locker along with a comfortable sized galley.